GBrunners | Game Boy Speedrunning Made Clear! Going fast isn't just a saying, it's a way of life for this week's featured runners! This week we feature some Game Boy games you may have never seen, thought about speedrunning, or it was soo good it had to be here. Check out this week's World Record Round Up! Never a dull week when it comes to Game Boy it seems. We have had many more busy runners exploring the depths of the game boy library and freshly introducing them to the world, along with others taking the world record to another level! Check out this week's World Record Round Up! Mario Golf GBC - Contra - Amazing Tater - Pocket Bomberman | World Record Round Up! With Summer Games Done Quick (SGDQ) a few weeks away. A lot of runners are focusing on their runs and getting the practice in and the commentary practice in to make sure they add a little extra shine to their big moment on stream. We also have A LOT of runners focusing on bettering times for games that may not have had a lot of attention for a while OR just may never really been thought about and didn't have a leaderboard. Incredible times, a surprising amount of runners, amazing viewers, somewhat decent commentators: This edition of the Tiny Ten had it all! 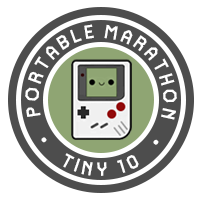 As the original organiser of this event (it's me: Moelle) I am truly honored how the Portable Marathon evolved into the past 2 years into something not only me, but the other organisers, runners and viewers alike all look forward to with the excitement of a toddler finding a worm in the backyard.